Black Raspberry Ice Cream Dessert had a major strike against it at the outset – black raspberry flavored Jell-O no longer exists. There was none on the supermarket shelf, and when I looked it up on the Kraft Foods website, I discovered that it’s no longer among the available flavors. (I don’t remember this being a problem when I made it in 2009.) So the recipe is called Black Raspberry Ice Cream Dessert, but now it’s just Raspberry Ice Cream Dessert, which isn’t quite the same thing. Since the required Jell-O flavor is unavailable, all bets were off with regard to the other ingredients: water, sherry, and vanilla ice cream. We don’t keep sherry around, because I’m not fond of fortified wines. That may be because of an experience I had early in my drinking career, when some well-meaning legal-drinking-age person bought me a bottle of tawny port, on which I got very drunk and subsequently very sick. Still, I do like how alcohol can enhance the flavor of Jell-O, so I decided to substitute a less-sweet wine. I thought I’d try for a full-bodied red wine, since I was losing some depth of flavor with red raspberry Jell-O, and I had a little glimmer of inspiration from a pleasant memory of life in Brooklyn. Several blocks from us in Park Slope there was a café called the Chocolate Room that did wine pairings with desserts, and they had a nice raspberry wine that went well with chocolate cake. I thought if I could find a raspberry wine here, it might work well with this Jell-O dish, so I went to our local hipster liquor store*, only to be thwarted once again. I had to turn to my miniscule wine stash, hoping I had a red that wasn’t “corked“, or vinegar. Luckily, I had a Beringer 2006 merlot that’s held up well, so I used that in the recipe instead of sherry. There was a brief moment of panic when I noticed that the raspberry Jell-O and merlot combination smelled rather like a household cleaner, but that aroma dissipated eventually. 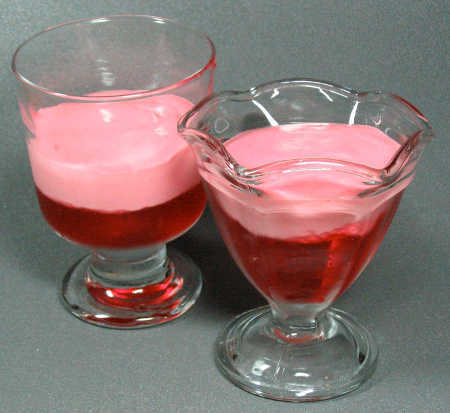 If you’re a regular reader of NJoJ, you might have already guessed that this is an ice-cream-based bavarian, and all there is to it is preparing the Jell-O as directed, substituting a quarter-cup wine for a quarter-cup of cold water. A pint of vanilla ice cream (I went with an old favorite, Ben & Jerry’s) is gradually melted into the liquid gelatin, and it gets chilled until firm. That’s it – hence its inclusion in the chapter titled “Nice Easy Things to Do with Jell-O”. I served my Raspberry Ice Cream Dessert with fresh blackberries, and it was okay. The wine flavor was a subtle and sneaky thing, and it didn’t blend well with the gelatin and ice cream flavors, but it wasn’t unpleasant. Otherwise, this was quite sweet. Also, the texture was very soft. I think this would be particularly good to have while recovering from dental surgery. * Funny story: One time Bryan and I were at City Liquors when a bro came in and asked one of the store employees if they had “pong balls”. “You know, the balls you play beer pong with?” The employee was bemused by the question. They carry a good selection of wines and a large assortment of craft beers; it’s definitely not a “pong ball” kind of place. Well, here we are back on the increasingly cracked and weedy Memory Lane. I have no recollection of this one whatsoever, which is hardly surprising considering that I made it almost seven years ago. So much water under the bridge, and, to be honest, there’s so much going on in the here-and-now that my brain doesn’t have a lot of room for nostalgia these days. So I’m working off of my old notes, which seem so uninformative now. This is one of those not-awful savory recipes, vegetables suspended in Jell-O instead of fruit. It’s seasoned with vinegar, salt and pepper, and I’m guessing that the amounts were adequate to counteract the sweetness of the Jell-O, because I didn’t remark that it was too sweet – though I did note that it “[wasn’t] Molded Tomato Relish, but definitely a WTF kind of thing”, so maybe it was still early enough in the Project that I didn’t quite know how to approach the savory ones. The vegetables involved are onion (grated), cauliflower, and pimento, and it looks like this one is another where I made the mistake of asking Bryan to pick up ingredients for me. Like a lot of people our age, he only knew of pimentos as the red things that sometimes appear stuffed into green olives, and he didn’t realize that you could buy them on their own in jars, so he bought me a red bell pepper instead, and that’s what I ended up using. Appearance-wise, that was probably close enough, but I bet that using pickled pimentos would have helped to further mask the sweetness of the Jell-O. As with Garden Soufflé Salad, I found the cauliflower to have an odd texture in the gelatin, and it tasted weird, too. I thought this dish would be better with celery Jell-O. The recipe suggests serving this with mayonnaise or French dressing if desired. No, I do not desire. One thing I did like about Sequin Salad was the appearance, which is so often Jell-O’s strong suit. However, it did not look appetizing to Bryan, who saw it as primarily “pale beige” because he’s red-green colorblind. I’ve known this about him for almost as long as I’ve known him, and with image-filtering technology I can get some idea of how the world looks to him. I suspect that the filtered image here is more yellow-brown than it would look to Bryan. He can actually see some red, although he tends to have trouble with the Pepto-pinks (so Jell-Os like Cherry Chiffon probably don’t look that great, either) and depending on the brightness, greens appear to him as yellow, orange, or brown. When he was a kid, he was confused by the expression “The grass is always greener on the other side of the fence” because all the grass looked orange to him. And there’s no good answer to that question. It’s a silly way to be an attention whore, is the honest answer. I started out with some lofty ideals, inspired by Michael Pollan and Morgan Spurlock. This was going to be a sort of running commentary about the terrible state of the typical American diet, dominated as it is by industrial food. Then I didn’t have the heart for self-righteous pontificating, and I decided that everyone else has been way too earnest about this stuff lately (like this guy) so really the Project was more of a nonsensical exercise in absurdism (somewhat in the vein of the Cacophony Society or the comedy of the Firesign Theatre). But I’m afraid that I’m just not that clever. You know what, though – it is kind of fun. Sometimes it’s positively hilarious. People find it strange and interesting when I tell them about my Project. (If only more of them would read it!) I’m finding that food – eating, cooking, even just talking about it – has a way of connecting people. It’s a small but terribly important point, and I think that’s really why I’m staying committed to the Project. Apart from all this self-pitying stuff, I’ve had a temporary shift in focus as Halloween approaches. I seem to have discovered that I rather enjoy playing dress-up, so I’ve spent a certain amount of time putting together the elements of my costume. It is kind of Jell-O related, so be sure to tune in on November 1, when I should be posting photos of my Halloween Jell-O Mini-Project. So, on to the Jell-O…. Layered Bavarian sounds much more elaborate than it really is. It’s two layers, a plain Jell-O layer and a Jell-O and vanilla ice cream layer (basically the same as Black Raspberry Ice Cream Dessert). Since the recipe allows for the use of any flavor, I went for strawberry. It was okay. I liked the contrasting textures in this dish, and strawberries and cream is always a good combination. However, there’s just no getting around the fact that a red flavor mixed with cream makes for a creepy-colored dessert. Also, I think this would have been better with real strawberries incorporated into it. I’m starting to understand how recipes like Florida Seacoast Salad came about. The General Foods R&D drones got bored. I hate to sound like I’m trying to make excuses, so please be assured that I’m telling you this by way of explanation. I’m suffering from election fever, and not in a good way. I’ve been spending more and more time paying attention to the U.S. presidential campaign, partly because I plan to vote for Clinton and I’m looking for positive reasons to do that, and partly because I don’t just want to see Trump lose the election, I want to see him crash and burn, and I want a front-row seat when that happens. (I generally try not to get too political here, but I trust no one who’s been following NJoJ is surprised by this.) In practical terms, this means that I’ve been slacking in other areas, like blogging, gym-ing, and sleeping. Even so, I feel like the there’s some serendipity in the way the timing has worked out on this, because just in time for Indigenous Peoples Day (as it’s now officially known here in Nerdvana) I get to crap all over Italian cuisine with a little dish called Antipasto Salad. Antipasto Salad is a savory Jell-O recipe with an unlikely assortment of ingredients, including salami, Swiss cheese, celery, raw onion, and olives. That big jug of vinegar you see in the photo is something I normally use when I’m washing a load of dishtowels to wash out that kitchen funk, but every once in a great while it gets pressed into service to mask the sweetness of Jell-O. Or to try, at least. “Recipe may be doubled” – but why? I made one serious mistake in preparing this, which was to ask Bryan to pick up the ingredients for me. After a cursory reading of the recipe, he bought sliced salami and sliced Swiss cheese, and decided that the six-week-old leftover celery from Garden Soufflé Salad would be okay to use in this recipe. (Rest assured, this has since been discarded.) I had him get me some fresh celery, but decided just to work with the sliced meat and cheese. You might recall that Bryan and I keep a mostly vegetarian diet (we also eat fish), so I hadn’t eaten salami in possibly more than 30 years. Maybe it was the brand that Bryan picked out, but when I tried it, I though to myself, “I’m ‘cheating’ for this?” I found it bland, and fatty. Maybe a good spicy Italian salami would have tasted better, but Bryan (rightly, I think) judged that it wouldn’t be worth using something like that in a Jell-O dish. Since I couldn’t really “finely cut” the sliced meat and cheese, I cut it into strips, figuring that I’d get the Jell-O nice and thick before adding the solid ingredients so that they wouldn’t just float to the top. The choice to buy a small quantity of olives from the salad bar was smart (because neither of us particularly likes olives), but I have to gripe a little, because slicing them was a pain in the neck. As I’ve done with past savory Jell-O salads, I prepared more of the solid ingredients than indicated in the recipe, trying for a more appetizing proportion of solids to jelly. Once again, I eschewed the ice cube quick-thickening method in favor of an ice water bath, and when the Jell-O was thick enough, I stirred in the other ingredients, put the lot in a decorative glass bowl, and put it in the fridge to firm up. Well, as it turns out, I picked the wrong recipe to spare you all from the guilt of not watching another of my cringe-worthy videos. Finally, I’d hit upon one that was truly foul. It didn’t even look nice, and it smelled bad. When I got it out to taste it, Bryan ran upstairs to hide. It tasted pretty bad, too. Despite the vinegar, the Jell-O was too sweet, and even though I’d added more meat, cheese and veggies, the solids-to-jelly ratio was still too low. Again I found myself wishing that I’d at least sautéed the onions a little in butter, because raw onions in Jell-O are just nasty. But can I take it? What is it I’m tasting here? When Bryan ventured back downstairs, I made him try a bite. His opinion of the dish was expressed mainly in a series of short grunts. We weren’t even able to finish off a small portion between the two of us. Most of this became garbage disposal food. A donation is being made to Action Against Hunger. I am truly sorry for this one.